GEC Osglim. 99% neon, 1% argon. A range of decorative glow lamps, given the name 'Filly', was marlketed by Habitat between 2004 and 2011. These lamps were maunfactured in the PR of China and appear to have been exclusive to Habitat. The models that were sold in the UK are intended for 220 to 240 V AC mains operation and have an integral ballast resistor. 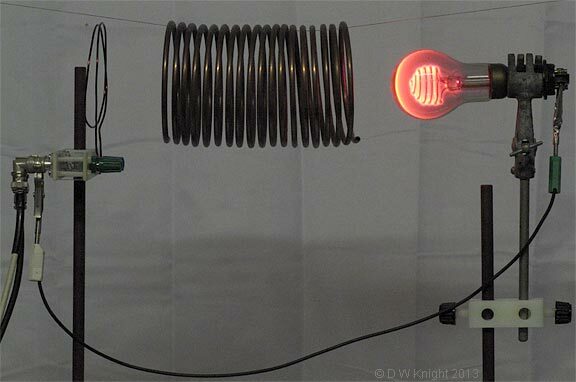 The Filly lamp is an argon discharge cathode glow lamp operated in anomalous conduction (complete cathode coverage) mode. 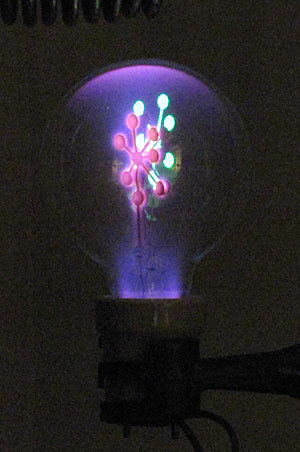 Electrically un-connected phosphor-coated structures within the bulb glow due to the UV from the positive column. The electrodes have a black amorphous barium coating to reduce the work function. Shown right is a Filly lamp under RF excitation at 24.7 MHz. The induction coil is above the bulb, and the two electrodes are grounded (hence the glow around the ES base). Using and understanding miniature neon lamps. W G Miller, 1969. SAMS. LCCN: 69-16778.